This afternnon saw the final part of our school election campaign. All of the children in Key Stage 2 (7 classes) came to the hall to hear final speeches from the party leaders. 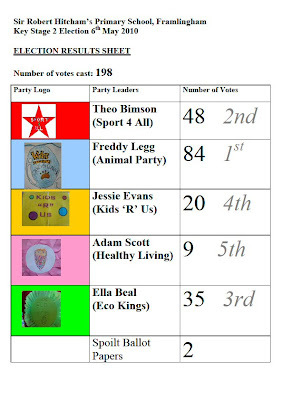 Each child was given a ballot paper and went into one of the voting booths. Their ballot papers then went into the ballot box. The winner was the Animal Party. However, they did not quite get an overall majority (more than 50% of the votes). Perhaps Freddy needs to talk to one of the other parties so that agreements can be made?